Some animals, including chimpanzees, crows, elephants, sea otters and dolphins, are known to use tools to extract food from their environment and for other functions. But what really sets people apart from tool-using animals is the uniquely human practice of using tools to make other tools, which researchers say requires another, more evolved level of intelligence. But when was the first instance of humans or even pre-human species using tools to make tools? 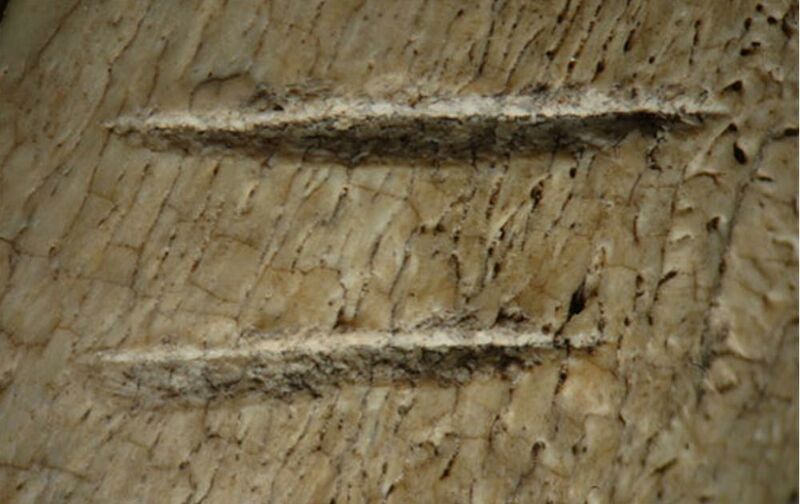 We can only speculate, but scientists working in Ethiopia have identified cut marks on fossilized animals bones buried in sediment from 3.4 million years ago—earlier than any other evidence of tool use found so far. This may mean that the ancestors of humans, a species called Australopithecus, were much more evolved intellectually than previously believed. "To make a stone tool, you use a tool to make a second tool," Briana Pobiner, a paleoanthropologist with the U.S. Smithsonian Institution, told Live Science . "There's a lot of planning and forethought involved," Pobiner said. The creatures had to choose the correct type of rock and the correct striking tool and hold both in the correct position and then strike in an exact manner to flake off chips and make a new tool. Pobiner was not involved in the recent study that examined the 3.4-million-year-old animal bones. The researchers involved re-examined the bones, which some theorized were marked simply by trampling, Live Science says. The new research does not definitively prove that early hominins cut the bones with tools, but if it is true, then our earliest cousins were using bones 800,000 years earlier than previously known. The theory that pre-human species cut the bones was put forward in 2010, but Live Science says at that time the earliest known evidence of tool use, from Gona, also in Ethiopia, went back only 2.6 million years. In May 2015, however, another team of researchers reported they'd found tools from 3.3 million years ago, in Kenya. The cuts marks on the animals bones, one from an antelope-sized creature and the other from a bison-sized creature, go back 100,000 years earlier than the tools from Kenya. The researchers simulated trampling of bones and compared them to the bones in question. The experimentally trampled bones appeared to have different types of marks than the bones from 3.4 million years ago. Just a few hundred meters away from the bone site, scientists had previously found a hominin baby, an Australopithecus specimen, that they estimated dates back 3.3 million years. Read more about How Much Evidence is Enough to Declare a New Species of Human from a Philippines Cave Site?